Worcester Warriors chairman Bill Bolsover has stepped down after the owners of Morecambe joined the board. Colin Goldring and Jason Whittingham have been confirmed as co-owners with Jed McCrory, who led a takeover of the Premiership club in October. Financier Whittingham and lawyer Goldring took over the Lancashire-based League Two side in June. “We would like to thank Bill for his contribution since he first joined the Board six years ago,” said Whittingham. “His help over the last two months has been invaluable and has ensured a smooth handover. Bill will always be a welcome visitor to Sixways,” he added in a statement. In April Worcester reported a pre-tax loss of £8.1m for the 2016-17 season – the losses came after the club reported a pre-tax profit of £14.3m a year before after the club’s owners wrote off loans worth £20.4m. “I agreed to stay on while the acquisition has taken place,” said Bolsover. 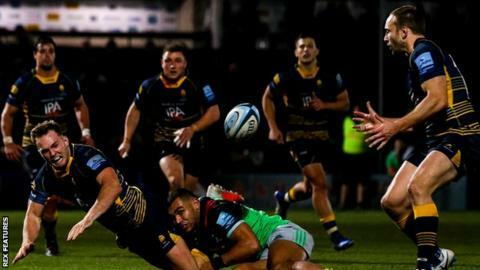 The takeover comes in the same week as Premiership Rugby agreed a £200m investment with former Formula 1 owners CVC Capital Partners.